Russian Disinformation - How Effective Is It? While the United States focusses on the Russian electoral interference narrative, a publication by the Center for European Policy Analysis (CEPA) entitled "Chaos As A Strategy: Putin's Promethean Gamble" provides us with an interesting analysis of the techniques that Russia may have used to spread disinformation and chaos across the Western world and whether or not these techniques were effective. 1.) Russia is in a power competition with Europe and the United States. 2.) To compensate for Russia's long-term internal decline, it is willing to take risks to balance its relative weakness against the West's relative strengths. 3.) Russia is using a strategy that offsets its own internal weaknesses by using a strategy in which the side that copes best with disorder is the winner. 4.) Russia is seeding chaos in the West by asymmetrical means including disinformation and political warfare. 1.) Ping pong - the co-ordinated use of complementary websites to springboard a news story into the mainstream media. 2.) Misleading Title - while the facts or statements in a news story are accurate, the title of the story is misleading. 3.) No Proof - the facts in a news story are not backed up with proof or accurate sources. 4.) Wolf Cries Wolf - an individual or organization is vilified for something that Russia also does. 5.) Card-Stacking - the facts or statements in a news story are partially true - the information is generally correct however key facts are omitted in an attempt to guide audiences to a false conclusion. 6.) False Fact - the facts or statements in a news story are completely false. 7.) False Visuals - fake or manipulated visual material accompanies a false fact or narrative to lend it extra credibility. 8.) Denying Facts - the real facts in a story are denied, undermined or reinterpreted to establish doubt regarding the validity of a story or narrative. 10.) Changing a quotation, source or context of a news story to change its meaning or importance. 12.) Narrative Laundering - concealing the provenance of a source or claim or imitating the format used by the mainstream media (i.e. the use of guest scholars or experts). 13.) Presenting Opinions As Facts (and vice versa). 14.) Use of Conspiracy Theories. 15.) Use of False Dilemmas - forcing audiences to choose between two options. 16.) Drown Facts With Emotions - present news stories in a fashion that causes facts to become less important. The authors suggest that there are several other methods that Russia is using to spread disinformation, however, these are generally variations of the methods that I have listed. It should be emphasized that Russian disinformation operations visible to English-language audiences are only part of a broader front covering multiple languages. These include not only state-backed media and trolling, but also “false flag” media—sock puppet websites set up to resemble genuine news outlets. These seed news feeds with false or contentious reporting that ties in with Russian narratives. This false flag approach extends in different directions, with RT determinedly masquerading as a broadcaster or cloning accounts on social media in order to mimic and discredit genuine Western media outlets. The Kremlin also relies on conferences, cultural activities (concerts and other events), video products (documentaries, art films, cartoons, video games, NGOs, individual speakers, opinion leaders, think tanks, and academia). The level of creativity deployed to undermine the West is certainly impressive." "The Center for European Policy Analysis (CEPA) is a 501(c)(3), non-profit, non-partisan, public policy research institute. Our mission is to promote an economically vibrant, strategically secure, and politically free Europe with close and enduring ties to the United States. Our analytical team consists of the world’s leading experts on Central-East Europe, Russia, and its neighbors. Through cutting-edge research, analysis, and programs we provide fresh insight on energy, security and defense to government officials and agencies; we help transatlantic businesses navigate changing strategic landscapes; and we build networks of future Atlanticist leaders." 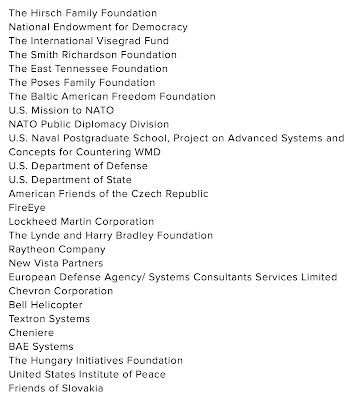 You'll note the close links between CEPA, United States defense contractors including Lockheed Martin, Raytheon, Bell Helicopter, Textron and the United States Departments of State and Defense. Obviously, CEPA has an agenda that is driven by its military-industrial-government stakeholders. 1.) Weakness 1 - "A first weakness of disinformation is that the Kremlin’s information campaigns can have unintended consequences inside countries that it is targeting. While the authors do not believe that Kremlin interference in the 2016 U.S. presidential election altered the final result in any way, the ensuing investigations, hearings, media, and public attention to this attack have placed Russian malign influence operations under unprecedented scrutiny. It is now harder for Russia to fly below the radar with disinformation operations. Its bot networks are easier to identify. Its trolls are easier to ignore. And social media companies are taking unprecedented steps to shut down both. Moreover, Russian observers have noted an increase in the appeal of “anti-Russian” political positions by leaders. This is what blowback looks like." 2.) Weakness 2 - "A second weakness of disinformation is that it becomes inherently more escalatory with time. Subversive moves that are initially surreptitious become more recognizable with use. Since it is ultimately a part of war, it is hard to know when a disinformation campaign is a prelude to more kinetic operations. The preparations and counter-moves that it prompts on the part of a target can trigger tests of strength, the avoidance of which was the starting aim of the strategy. Although Putin has escalated crises in order to escape them, he appears unwilling or politically unable to deescalate in a way that would not look like defeat." 3.) Weakness 3 - "A third weakness of disinformation operations is that they are hard to measure precisely— and their actual impact may be exaggerated." It is interesting to see that, despite the numerous methods of Russian disinformation propagation that the authors present in this paper, they believe that the impact of the Russian propaganda/disinformation has been relatively minor, having no impact on the final result of the 2016 U.S. Presidential election. 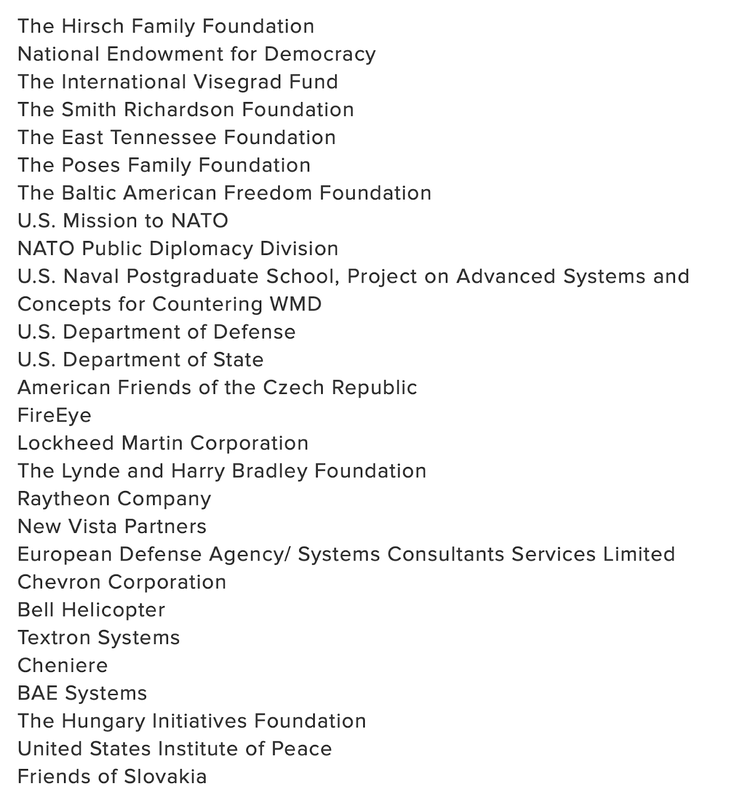 That said, CEPA still stands behind its anti-Russia narrative, much of which is driven by its financial backers who have a vested interest in ensuring that Washington remains on a war-footing. In addition, it's certainly a good thing that the Western media would never dirty itself with any of the disinformation techniques used by the Russians, isn't it? "To prevent war and insure our survival in a stable world, it is essential that we look abroad through our own American eyes and not through the eyes of...the anti-Russian press. The real peace treaty we now need is between the United States and Russia. On our part, we should recognize that we have no more business in the political affairs of eastern Europe than Russia has in the political affairs of Latin America, western Europe, and the United States. We may not like what Russia does in eastern Europe. Her type of land reform, industrial expropriation, and suppression of basic liberties offends the great majority of the people of the United States. The Way to Peace - September 12, 1946. Mike Pompeo on Latin America - Waging Peace?